As part of this week’s GTC 2018 keynote address, NVIDIA CEO Jen-Hsun Huang quickly touched upon the future of NVIDIA’s ARM SoC lineup. While the company no longer publicly advertises or sells new ARM-based SoCs – the last SoC branded Tegra was the Tegra X1 – they have continued development for private uses. Chief among these of course being their DRIVE systems, where the Xavier SoC is at the heart of both the single-SoC Xavier module, as well as the larger and more powerful muti-processor Pegasus module for level 5 vehicles. While Xavier itself is just now sampling to partners, NVIDIA already has their eye on what’s next. And that is Orin. Unlike even the Xavier tease in 2016, NVIDIA is saying very little about Orin other than the fact that it’s the next generation of NVIDIA SoCs. Like Xavier, it’s a single-chip solution. But otherwise we don’t know anything about the planned architecture or features. 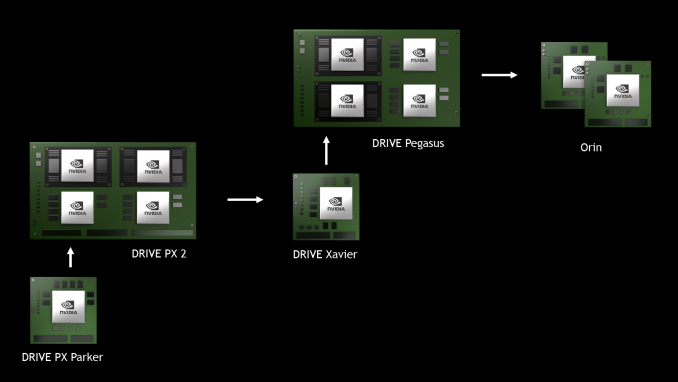 With respect to performance, NVIDIA isn’t giving hard figures there either, but they are saying that they want to replace a Pegasus module with a couple of Orins. Pegasus, as a reminder, is a pair of Xaviers each with an unnamed, post-Volta discrete GPU attached, with a total power consumption of 500W. So to replace that with a couple of single-chip SoCs would be a significant accomplishment – and presumably a massive bump in energy efficiency. There is no such thing as 8bit float. Floating point numbers at 8bits of precision defies basic common sense. Lowest precision floating point implementations are 16 bit, i.e. half precision. Sure. But I think it's interesting to know that the option for 8-bit floats exists. No. They also use up more die area than int, and if the benefits were that great, then we should've long ago seen a surge games' demand for fp16. In fact, having to support denormals probably burns most of the die area savings vs. fp16. The reality is that GPUs had fp32 in such abundance that games ditched fixed-point arithmetic long ago. In fact, it's in such low demand that GCN only bothered to implement a scalar integer ALU, as opposed to the 64-wide SIMD they have for fp32. fp16 is twice as energy efficient compared to fp32, and requires about half of the chip size for the same performance (or more, as multiplying 11-bit mantissas is way more than twice as cheap as 24-bit mantissas). Meaning enablement of 1080p+ gaming on battery-powered, even small and light laptops, just as it enabled phone and tablet games. It is also more useful for AI for the same power+performance+cost reasons. And that first link you posted really drives home the point about how tricky float8 would be to actually use. You'd have epsilon issues all over the place!